This plan was published in William Maitland's 'History of London from its Foundation to the Present Time'. The plan's title features in cartouche at the foot of the plate with the family arms of the dedicatees Stephen Theodor Janssen (Alderman of Cordwainer ward and Lord Mayor of London) and William Alexander (Alderman of Breadstreet ward) at top left and right, respectively. Views of St Matthew and St Mildred's parish churches are at bottom left and bottom right. 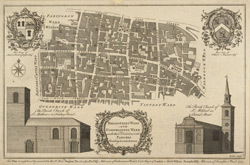 Maitland's ward plans were largely derived from Strype's plans, with the illustrations copied from West & Tow's 'Prospect Views of Ancient Churches' of 1736.